I’m very pleased that the second volume of Myrdle Press’s book, CRITICAL CITIES vol. 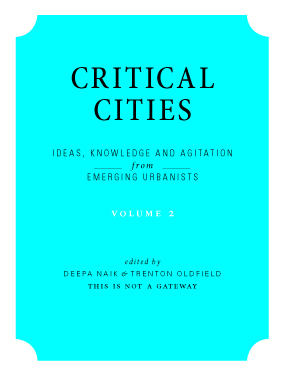 2 The Urban Industry and its Post-Critical Condition, by Deepa Naik & Trenton Oldfield is out now. I attended the launch on Oct 21 which was also the opening of the THISISNOTAGATEWAY festival of urbanism. There are a many interesting articles and photo-essays, and I am very proud to say that my chapter, an article called ” i am here” is also part of the book. I was aiming at a text that somehow combined critical, intellectual approach with clarity, but also, importantly, with poetic language, and I think (hope) I did it. Previous thought for the day?